Department of Pharmaceutical Sciences, Jawaharlal Nehru Technological University, Hyderabad, Telangana, INDIA. Drug Discovery and Development, Shadan College of Pharmacy. Department of Pharmaceutical Sciences, Geethanjali College of Pharmacy. The objective of the present study was to find out the pharmacodynamic and pharmacokinetic interactions of piperine on gliclazide in rats and rabbits. Influence of piperine on the activity of gliclazide was determined by conducting single- and multiple-dose interaction studies in rats (normal and diabetic) and diabetic rabbits. Blood samples collected at predetermined time intervals from experimental animals were used for the estimation of glucose and insulin levels by using automated clinical chemistry analyzer and radioimmunoassay method, respectively. β-cell function was determined by homeostasis model assessment. Additionally, serum gliclazide levels in rabbits were analyzed by high-performance liquid chromatography. 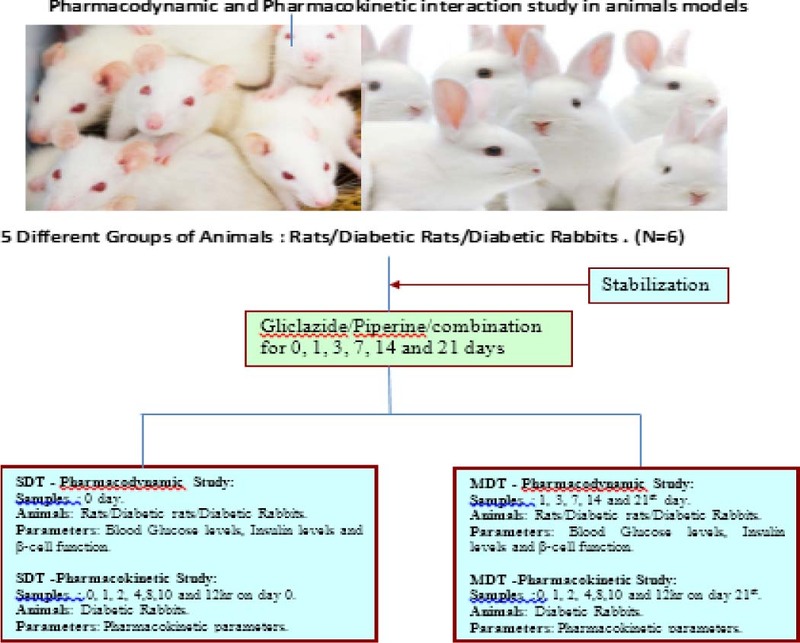 Gliclazide showed significant reduction in blood glucose levels in diabetic rats and rabbits. Similarly, piperine also showed significant reduction in blood glucose levels in animals. Additionally,, samples analyzed from all time points in combination with piperine showed peak reduction in blood glucose in diabetic rats and rabbits. The pharmacokinetics of gliclazide was also altered by single- or multiple-dose piperine treatments in rabbits. The interaction of piperine with gliclazide upon single and multiple-dose treatment was pharmacodynamic and pharmacokinetic in nature, indicating the need for periodic monitoring of glucose levels and dose adjustment as necessary when this combination is prescribed to diabetic patients. Diabetes mellitus is the most severe metabolic disorder characterized by absolute or relative insufficiency in insulin secretion and/or its action.1 Gliclazide (second generation sulfonylurea derivative) is the preferred choice of drug.2 Piperine is an alkaloidal compound and is an active constituent of black and long peppers. It has been found to have anti-diabetic activity per se. Piperine can improve the bioavailability of many drugs and decrease the elimination of the drugs and finally improves the biological effectiveness. Piperine is known to inhibit human CYP2C9, CYP3A4 and P-glycoprotein.3,4 But the influence of piperine on diabetic patients who are under the treatment with Gliclazide is not proved yet. Hence, the present study was designed to find out the pharmacodynamic and pharmacokinetic interactions of piperine on gliclazide in rats and rabbits. Gliclazide was obtained as a gift sample from Dr Reddy’s Laboratories (Bachupally, Hyderabad, Telangana, India). Piperine was purchased from HiMedia Laboratories private limited, Mumbai. Alloxan monohydrate was purchased from Loba Chemie (Mumbai, Maharashtra, India). All reagents and chemicals used in the study were of analytical grade. Piperine solution was prepared in 2% Gum acacia solution. Eight to 9-week-old male albino rats weighing between 170 and 250 g and 3-month-old male albino rabbits weighing between 1 and 1.5 kg were procured from M/s Mahavir Enterprises, Hyderabad. They were maintained under controlled room temperature (24±2°C; relative humidity 60-70%) in a 12h light – dark cycle. The animals were given a standard laboratory diet and water ad libitum. The animals were acclimatized before the study. Group III : Gliclazide (2 mg/kg for rats/4 mg/kg for rabbits) body weight, p.o. Group IV : Piperine (20 mg/kg) body weight, p.o. Group V : Piperine (20 mg/kg) + Gliclazide (2 mg/kg for rats/4 mg/kg for rabbits) body weight, p.o. Stage 1 : Pharmacodynamic interaction in normal rats. Stage 2 : Pharmacodynamic interaction in diabetic rats. Stage 3 : Pharmacodynamic and pharmacokinetic interaction in diabetic rabbits. The blood was drawn from the retro orbital plexus of the rats (fasted for 14 h) under light ether anaesthesia on different occasions i.e., day 0, day 1, day 3, day 7, day 14 and day 21. On day 0 (SDT) and day 21st (MDT) blood samples collected at different time intervals as 0hr, 1hr, 2hr, 4hr, 8hr, 10hr and 12hr for pharmacokinetic study experiment. Blood samples were withdrawn from the marginal ear vein of each rabbit. Blood samples collected at predetermined time intervals from experimental animals were used for the estimation of glucose and insulin levels by using automated clinical chemistry analyzer and radioimmunoassay method, respectively. β-cell function was determined by homeostasis model assessment. Additionally, serum gliclazide levels in rabbits were analyzed by high-performance liquid chromatography. Fasting serum glucose (FSG) in mg/dL. Pharmacokinetic parameters of gliclazide in rabbit serum such as peak serum concentration, peak time, area under the concentration time curve, area under first moment curve, terminal half-life, elimination rate constant, mean resident time, and clearance were estimated by using Kinetica 5.0 software. The data was analyzed using one-way analysis of variance (ANOVA), followed by Dunnett’s test and p<0.05 was considered as statistically significant. The data was expressed as mean ± Standard deviation (SD). Gliclazide produced significant hypoglycemic activity in normal rats with maximum percent blood glucose reduction of 45.5% (Table 1) and antihyperglycemic activity in diabetic rats and rabbits with peak percent blood glucose reduction of 56.4% and 47.5%, respectively (Table 2 and 5). Piperine also produced significant hypoglycemic activity in normal rats with maximum percent blood glucose reduction of 35.5% (Table 1) and antihyperglycemic activity in diabetic rats and rabbits with peak percent blood glucose reduction of 48.6% and 37.6%, respectively (Table 2 and 5). The combination of Gliclazide with Piperine produced significant hypoglycemic activity in normal rats with maximum percent blood glucose reduction of 49.6% (Table 1) and antihyperglycemic activity in diabetic rats and rabbits with peak percent blood glucose reduction of 68.8% and 62.0%, respectively (Table 2 and 5). Single and multiple dose combination of Piperine with gliclazide induced significant changes in percent blood glucose reduction, insulin levels and β-cell function in animal models. However, multiple-dose combination of Piperine with gliclazide produced significantly greater reduction in percent blood glucose reduction after treatment in diabetic rats and rabbits when compared with diabetic control. Piperine exhibited additive effect by increasing the activity of gliclazide. Significant changes were observed in insulin levels and β-cell function (Tables 3,4,6 and 7) in both the animal models. The pharmacokinetic parameters of gliclazide alone and in the presence of piperine following single- and multiple-dose administrations were given in (Table 8). Piperine was found to alter the pharmacokinetics of gliclazide in rabbits. Mean percent blood glucose reduction of gliclazide in presence and absence of Piperine in single and multi-dose study for normal rats (n=6). Notes: Data expressed as mean ± standard deviation. ** (p<0.01) statistically significant when compared with normal control. Mean percent blood glucose reduction of gliclazide in presence and absence of Piperine in single and multi-dose study for diabetic rats (n=6). ** (p<0.01) statistically significant when compared with diabetic control. Effect of Piperine on insulin levels in diabetic rats (n=6). Effect of Piperine on β-cell function in diabetic rats (n=6). Mean percent blood glucose reduction of gliclazide in presence and absence of Piperine in single and multi-dose study for diabetic rabbits (n=6). Effect of Piperine on insulin levels in diabetic rabbits (n=6). Effect of Piperine on β-cell function in diabetic rabbits (n=6). Mean pharmacokinetic parameters of gliclazide in presence and absence of Piperine in rabbits (n=6). Diabetes mellitus is the most severe metabolic disorder characterized by absolute or relative insufficiency in insulin secretion and/or its action.1 Gliclazide (second generation sulfonylurea derivative) is the preferred choice of drug.2 Gliclazide is primarily metabolized by CYP2C9 and partly by CYP3A4.7 Piperine is an alkaloidal compound and is an active constituent of black and long peppers.3,4 It has been found to have anti diabetic activity per se.13 Piperine can improve the bioavailability of many drugs and decrease the elimination of the drugs and finally improves the biological effectiveness. Piperine is known to inhibit human CYP2C9, CYP3A4 and P-glycoprotein.3,4 The present study was designed to assess the pharmacodynamic and pharmacokinetic interactions of piperine on gliclazide in animal models. The study revealed that piperine exhibited significant hypoglycemic and antihyperglycemic activity. It also enhanced the activity of Gliclazide significantly and showed additive effect. Piperine increased the insulin levels in diabetic rats and rabbits significantly and enhanced the β-cell function. The possible mechanisms of hypoglycaemic action may be by increasing either the pancreatic secretion of insulin from β-cell of islet of Langerhans or its release from pro-insulin form.14 Piperine also altered the pharmacokinetic parameters of Gliclazide which might be due to inhibition of human CYP 2C9. The interaction of piperine with gliclazide up on single and multiple-dose treatment was pharmacodynamic and pharmacokinetic in nature, indicating the need for periodic monitoring of glucose levels and dose adjustment as necessary when this combination is prescribed to diabetic patients. Nevertheless the adequate information on the safety of phytochemical constituents not well established, their use as alternative and/or complementary medicine is globally popular. Piperine, a richest source from pepper is a natural bioenhancer, confirmed for hypoglycemic activity in normal animals and exhibits significant anti hyperglycemic activity in diabetic models. The combination of gliclazide and piperine was confirmed to be a pharmacodynamics and pharmacokinetic drug interaction category and the antidiabetic activity was more significant in combination compared with each individual drug results. The authors are thankful to Dr Reddy’s Labs Ltd, Hyderabad,India, for providing gift sample of gliclazide for the research work. The authors are grateful to the management of GBN Institute of Pharmacy, Ghatkesar, Hyderabad, India, for providing support in supplying and conducting of animal experiments. Mr. Umachandar. 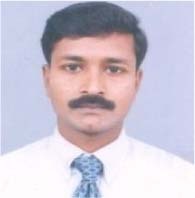 Lagisetty is a research scholar at Jawaharlal Nehru Technological University, Hyderabad. He has completed Bachelor and Master of Pharmacy from University college of Pharmaceutical sciences, Kakatiya University, Warangal. 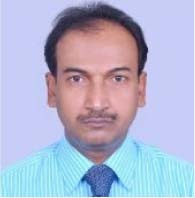 Dr Habibuddin Mohammed: Is working as a Professor and Director, in Shadan college of Pharmacy, Hyderabad Since October 2014. He is a doctorate in Jadavpur University (JU) and recipient of young scientist award from Italian pharmacological society. Dr.Habib is an articulate exponent in the area of pharmaceutical sciences having two patent and a total of more than hundred national and international publications to his credit. His research area includes new drug discovery and development. 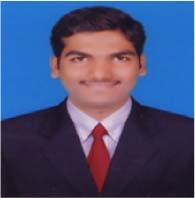 Dr. R. Sivakumar: Is working as a Professor and Head, in Geethanjali college of Pharmacy, Hyderabad since October 2009. He completed his PhD in Central Food Technological Research Institute at Mysore, Karnataka and published more than thirty five research publications both international and national level to his credit. His research area includes enzymatic synthesis in organic media, synthetic chemistry and pharmacological studies.